Held the last Rabbit Hunting Saturday in February. Hunters head back to the clubhouse and are joined by other members for some refreshments and hold the annual Kappenversteigerung or Hat Auction. Held in March on a Sunday afternoon. Our AGM is the summary of the previous year’s happenings. All events and upgrades are reported as well as the financials. The Budget for the coming year is also presented in the first part of the meeting. The Elections for Half of the Board of Directors takes place. A Light Supper is provided for all members in attendance. Held in the spring. This event replaced the Hasenpfeffer which was the oldest event that started March 3, 1954. Crowning “Miss Hubertushaus” is the highlight of the day and many of the previous “Misses” are in attendance. It is an All Ages DJ dance and is a ticketed event with an All You Can Eat Schnitzel Buffet. Contact the entertainment committee for your ticket. The very first fish fry was held September 28, 1963 featuring our very own fish from the pond. Later it moved to Honey Harbour where the annual Father /Son Fishing Derby ran for many years before settling back home. It is now held the day after work day. The fish is prepared on our outdoor bbq by club members in the wee hours of the morning to be ready for the public to enjoy the special recipe. Volunteer to find the secret ingredients. This is an at the door ticketed event. Held the Saturday of Father’s Day Weekend in conjunction with the Transylvania Club and Schwaben Club. Food is barbecued and plated for a fee. There are children’s games and a friendly horseshoe tournament in the afternoon. Volunteering this day ensures you get a behind-the-scenes perspective of the club. In 1984 we celebrated our first Oktoberfest and joined K-W Oktoberfest in 1985. We have been the recipient of numerous awards over the years for best food, entertainment, hospitality, decorations and overall Bavarian atmosphere. Bogenschutzen is the longest running cultural event of KW Oktoberfest which began early 1970. Saturday is the Eagle shoot. Archers use blunt nose arrows to break off pieces of the eagle. Sunday archers test their skill on the running deer/boar. 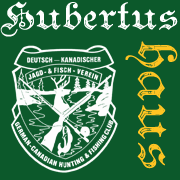 Hubertushaus is run by volunteers that are smart served certified and knowledgeable in all areas. The grandest area is Gemuetlichkeit. Set up is always the Saturday before opening day. Miss Hubertushaus will accompany the youth on the fall Road Clean Up. Tear down is always the immediate Sunday after closing. Remember many hands make light work. Held in the fall after the big game hunt. Traditionally Sauerbraten –a marinated beef roast- is served with all the trimmings. Sportsman and Woman of the Year awards are presented. Seven Castles, our house band entertains us thru the rest of the night. Tickets are available thru the entertainment committee in advance. Held the second Sunday in December. All member’s children and grandchildren are welcome. Sing-a-long, games, crafts, light lunch, snacks, and a magical visit from Santa complete with a gift fills the afternoon. Register the children with the entertainment committee (inform how many adults will accompany the children). Held the second Saturday in December. A traditional turkey dinner with all the trimmings served country style and topped off with the homemade desserts. Seven Castles starts the evening off with a German Christmas Sing-a-long and delights us with music into the wee hours. This is the one of the favourite events of the year. Christmas decorating starts right after the Jägerball to let all the hall renters enjoy the festive season in our beautiful hall. Call the entertainment Directors for tickets and times.